I’ve got another super easy recipe for you today. I love these simple cookie recipes/baking crafts I’m finding. The holidays can be such a busy time with family gatherings, holiday parties, and trying to make everything “meaningful”. Baking is often one of those things that gifts left out because it takes so much time. Not everyone is lucky enough to have days they can devote solely to cooking and baking. So easy recipes like this (Funfetti Christmas Trees, Christmas Tree Brownies, and White Chocolate Oreos are also good too!) are essential to have in your repertoire. 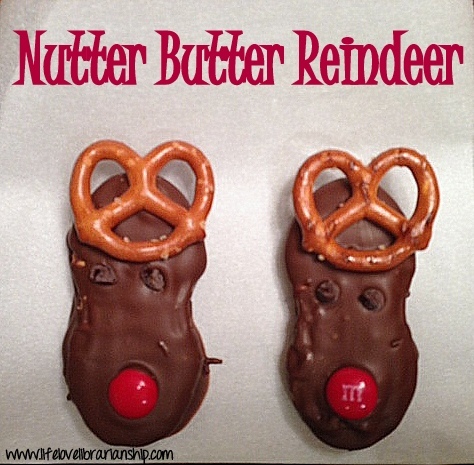 I like to think of Nutter Butter Reindeer as more of a Christmas baking craft than an actual cookie recipe. The only cooking you do is melting chocolate (can we call that cooking?) so this is a perfect activity to do with kids. 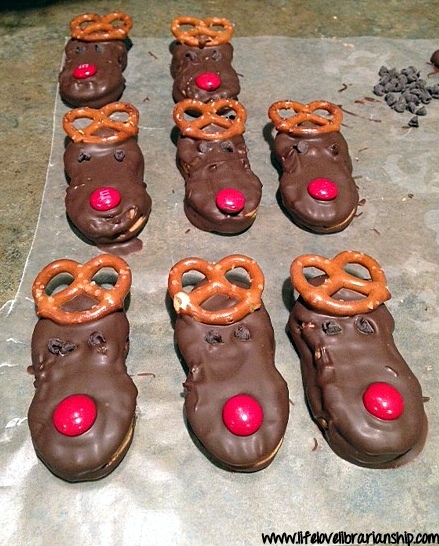 What kid doesn’t like getting all covered with chocolate and turning cookies into reindeer? Melt chocolate in a microwave-safe bowl according to package instructions, until melted and smooth. Working with one cookie at a time, dip the cookie in the melted chocolate and coat all sides. 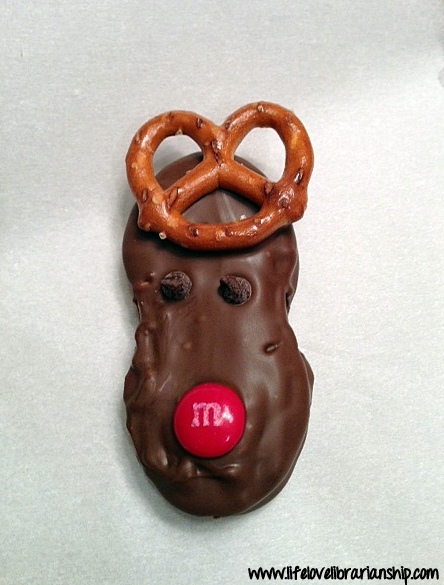 Place the cookie on wax paper, add pretzels for antlers, chocolate chips for eyes, and M&Ms for a red nose. Repeat as desired. Allow to harden completely before storing. These look really awesome! These look absolutely divine!! You have photographed them so well. Thank you! I’m really working on improving my photography. Next post: So, You Want to Be a Hospital Librarian?